Gabby Hanson had to sit early in the game after being called for fouls, but returned with a vengeance. Photo by Karl Maasdam. For the second straight season, Oregon State will play for a Pac-12 Tournament title. With four players in double figures — led by Sydney Wiese’s 19 — the Beavers advanced to the championship game with a 63-53 victory over UCLA on Saturday night at KeyArena. Mikayla Pivec had 15 points, Gabriella Hanson had 12, and Marie Gulich had 10 along with a career-high 16 rebounds for Oregon State. 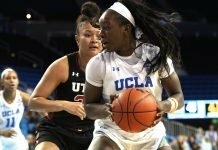 Jordin Canada had 27 points to pace the Bruins, while Monique Billings finished with six points and eight rebounds. Though Oregon State turned the ball over a season-high 22 times, the Bruins couldn’t capitalize, plagued by cold shooting, especially in the second-half. UCLA shot 31 percent for the game, and 23 percent over the final 20 minutes. 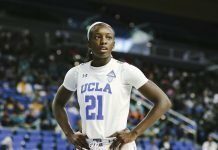 After a back-and-forth first quarter, UCLA took a seven-point lead — its largest of the night — with just over four minutes to play in the second, after a lay in from Canada. The Bruins took a three-point advantage into the break. That stretch came with defensive stopper Hanson on the bench for the final eight minutes of the quarter. 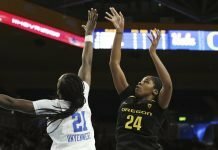 But as Oregon State pulled ahead in the third, while UCLA went 3-of-16 from the field in the quarter, Close believed her team was getting good looks at the basket. That was something Canada saw as well. Despite the team’s offensive struggles, the Bruins remained close late. With a pair of jumpers by Kennedy Burke, UCLA pulled within three with just over four minutes in regulation. But two three-pointers from Wiese, a jumper from Gulich, and a lay up from Pivec put the game away. For Close, the inability to turn OSU turnovers into points was too much to overcome. 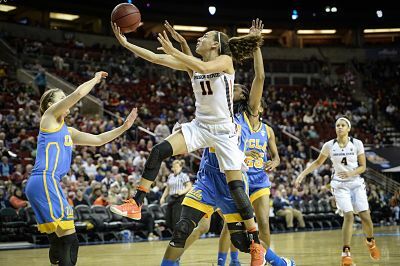 Oregon State will play Stanford with the chance to win back-to-back tournament crowns. The Beavers won both matchups against the Cardinal this season, a 72-69 double-overtime win in Palo Alto on Jan. 8, and a 50-47 win in Corvallis on Feb. 24.